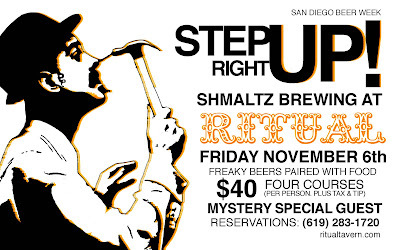 To kick off San Diego Beer Week, Shmaltz Brewing Company and Ritual Tavern will team up to present a beer and food pairing dinner that you won't soon forget. For only $40.00, you will be treated to four delicious courses paired with four of Shmaltz Brewing Company's award-winning beers, you'll also enjoy an unbelievable performance by the Saint Twins, the world's first and only twin thought readers. Featuring both HE'BREW beers as well as Coney Island Craft Lagers (TM), this unique menu is inspired both by Jewish food culture as well as the age-old carny lifestyle. Join us for a night of food, freaks, and fun! *Menu subject to change based on availability and whim of the chef. L'Chaim! !